Singapore in my view is like something out of one of those computer games where you create a city. Everything is neatly where it should be, there are some very expensive wonders plopped about the countryside, the people all busily scurry about doing things with the sort of logic which leads them to neglect to wear hats in a place where it is constantly hot and sunny. It’s lovely in its way but not real. That said, today we visited Sentosa Island, which is the place the Singaporean’s go to experience unreality. It’s hard to know how to react to somewhere that’s so, so… manicured. It has all the requisite things for a holiday island. Palm trees. Sandy beeches. Shops and bars. And every one of those things is exactly where it should be. You get the sense that every single rock was placed just so for maximum effect and minimum risk. Like being in a computer game, it’s rich and intriguing, but there’s definitely some essential piece of reality missing. None of which takes away from it being an enjoyable place to visit for a day. We caught the highly efficient monorail out to the island for a few cents and then we all got to ride on Segways. Yes, we got to ride on Segways. I have always wanted to ride on one and today I got to ride on a Segway. Jut in case you missed it: we rode on Segways! 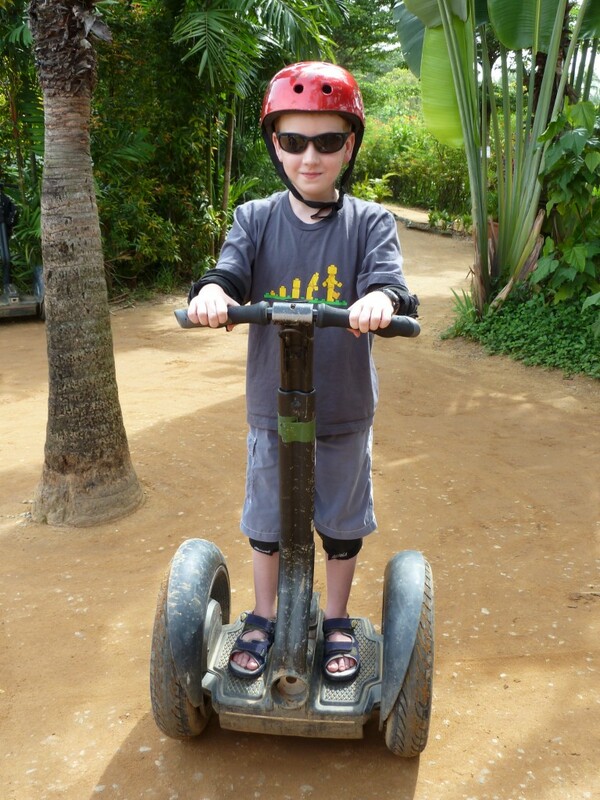 Apart from the fact that this was, quite seriously, a long-held ambition of mine, the thing that set this apart from Segway experiences we have seen in other parts of the world was that the kids could do it. There was a minimum height requirement but no age issue – in stark contrast to a similar operation I read about in Germany where they require you not only to be over 18 but to hold a motorcycle license. So we all barrelled about after a couple of minutes instruction: demonstrating that Segways are really very intuitive to ride and very difficult to fall off. And we each finished our ride with a big smiles on our face; it wasn’t just me. We followed that up by walking about the Island for a while. The beaches are lovely in a resort-swimming-pool type of way and we had a very refreshing swim in the luke-warm waters. The slightly strange sense of the place was heightened by the contrast between the perfect beach on the one hand and, when you turned out to sea, the working ships all queued up, waiting to make use of the port. We took a look at the islet which is advertised as the most southern point in continental Asia and puzzled over how this could be so when there was land further south on both sides of it. Our only conclusion is that this was really the most southern point in continental Asia where it was possible to build a distinct tourist attraction. I can’t say we minded either way as we were all taken with the suspension bridge leading out to it that hangs so low you walk through the water. Onwards and upwards, a long way upwards. We caught the trams and a bus and then walked right to the top of the Sentosa hill. There’s a lovely nature walk up there where we learnt to identify simple and compound leaves and failed to see a single monkey in spite of warning signs holding that out as a tantalising opportunity. We then managed to lose all of that gained height in a minute or two as we flew back down to sea-level on a zip line. Just in case you don’t know, the zip line involves you getting into a harness and being attached to a roller sitting on a rope. Then, swinging wildly, you roll down 500m of line at hair-straightening speeds. Jennifer and Declan went first so they could act as official photographers from the bottom. That left the height-adverse part of the team up the top. I was really proud of the way Callum handled it, knowing how much he fears exactly this sort of thing. (I was pretty proud of the way I handled it too, but I had the distinct advantage of having to look calm for Callum.) It turned out the fear-factor was low but the excitement was exhilarating. On a different budget, we’d all have done it again in a flash. There were many, many other things we could have done on Sentosa. We were limited partly by budget – the place is set up to extract the maximum dollar possible from each visitor – and partly by just not liking much of what was on offer. It’s the sort of place you’re better off treating as a smorgasbord and just picking out the bits that appeal to you. Over-indulgence could be ugly. As it was, couple of novel experiences in a lovely environment made for a pretty good day. And did I mention we got to ride on Segways? P.S is your apartment situated in the main street/road orchard road. P.S have you been to takashimaya the famous japanese mall (which is basically the biggest mall I have ever seen.